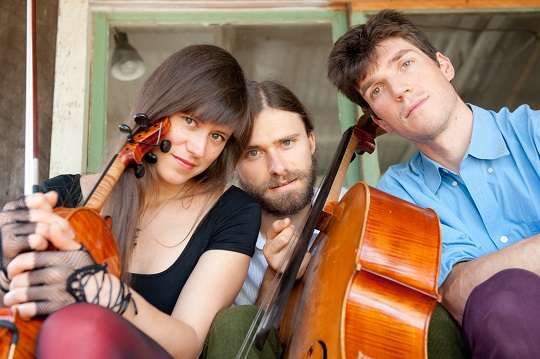 The Bee Eaters combine the fine details of chamber music, the velocity and high spirit of bluegrass, and the melodic resourcefulness of pop music. This band has a unique American sound. Grand National Fiddle Champion Tashina Clarridge has toured with Mark O’Connor, Tony Trischka and Laurie Lewis and performed at Carnegie Hall. Multi-instrumentalist brother Tristan Clarridge is a 5-time Grand National Fiddle Champion and a pioneering cellist, synthesizing traditional folk influences with rhythms jazz, rock and pop music, leading a revolution among adventurous young cellists throughout the country. Hammer dulcimer wizard Simon Chrisman brings a whole new approach to an instrument previously thought to have limited range. His inventive touch and sophisticated rhythmic sensibilities redefine the instrument. Tonight The Bee Eaters will be joined by Sean Watkins, a stunning songwriter, guitarist and founder of Nickel Creek.